A comprehensive shareholders agreement for a new company that has also been financed with debt from a big lender as well as equity. Use this agreement to protect the rights of each shareholder against each other and the debt provider and also for setting down the strategic management of the company. This agreement could be put in place at the time of incorporation or shortly afterwards in order to set out the balance of hareholder power as the company grows. It is suitable for companies where all or some shareholders are also directors, or where there is a mix of active and inactive owners. A shareholders agreement is an essential document to confirm the rights of the shareholders, one against another and against other stakeholders in the business, and to set out how the shareholders intend to operate the company. It takes over where company law stops. The first is to protect minority shareholders' rights and investment value. Without an agreement, majority shareholders may force issues that are not in the minority shareholders' interests and that could reduce the value of the minority shareholders' interests in the company. The second is clarity of decision making. In circumstances where shareholders of any size are also directors, operational decisions that would ordinarily be taken by directors accountable to all shareholders or made only with the consent of all shareholders might be made instead in the interest of a single shareholder without having been brought to the attention of the others. A good shareholders' agreement should set out the decisions that must be made in the capacity of a shareholder rather than a director. Similarly, directors may feel unable to take business decisions (and act as directors) without shareholder approval. Disputes between shareholders and other stakeholders are expensive and can be disruptive and detrimental to the on-going operation of the business. Having a clear agreement in place reduces the likelihood of disputes and makes resolving any that do occur easier. A clear and comprehensive agreement also reduces the need for subjective decision making by an arbiter or judge that can give shareholders, and particularly minority ones, so much uncertainty and worry. Two versions of the Net Lawman shareholders' agreement (this is one) cover the situation where the motivation to enter into a new shareholders' agreement or improve an existing one, is the appearance of a new lender. There are many ways a loan agreement can be structured. The most common is for the lender to take some shares, either by new issue or maybe an option. The larger part of the money introduced is then provided as a loan, secured against the assets of the company, or by personal guarantees of shareholder-directors. So far as the lender takes shares, he will want to safeguard his position as a (probable) minority shareholder so as to give him de facto control of the company if it fails to deliver on the promise of success. To achieve that requires small changes to the situation, for example, where a company is run by directors who are all shareholders. The new lender may want board representation, but more commonly, he will wish to stay apart from management, so that he cannot be blamed should the company fail to prosper. So, while one of the main purposes of a shareholder agreement is to protect minority shareholders, the versions dealing with a "major lender" provide additional control for that entity. Of course, it is up to those who manage the document to make what changes they wish. The Net Lawman shareholder agreements are very comprehensive, as you will see. This shareholders' agreement protects the interests of the minority shareholders and provides a detailed framework of freedom for working shareholder-directors. The document additionally includes provision for valuation of the shares of a departing shareholder by reference to a valuation based on your instructions to an accountant. The valuation depends on the parameters used, so your instructions are critical. We have provided a comprehensive version which you can edit according to the deal you wish to strike with a selling shareholder. The law in this shareholders' agreement is based on both company law and contract law. Within the structure of company law, you can choose the terms that best suit your situation, so you do not need to study any particular law to be able to edit your shareholders' agreement. The agreement is up-to-date and very comprehensive. This agreement is suitable for any private company, no matter what its business. It is about rights, power, control and safeguards, not about your business. 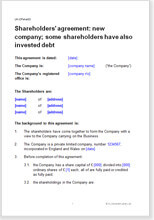 A company's shareholders agreement can be redrawn at any time, but is commonly done when the relationship between the shareholders and the directors changes. For a new company, it can be put in place from Day 1, or shortly afterwards. The best time is always "now". Clarity on how decisions are made will let you sleep better at night, whether you hold a small proportion or a large majority of the shares. All the shareholders must sign the shareholders agreement but there are no rules about which of them must manage the process of taking the agreement through to signatures. Any shareholder could suggest that the document is necessary and could start the discussions. No other shareholders' agreements for sale on the Internet are in plain English or are so comprehensive in their cover of legal issues and the drafting explanations and tips supplied. Net Lawman's slogan "Real law, in plain English" is as true of this document as of any others. In many areas, we give you complete alternative paragraphs and explain in the notes when each will be the most suitable for you. This document contains over twenty commercial paragraphs as well as what you might call technical legal provisions. You can choose which are suitable for your needs. Many are based on our practical experience as solicitors of dealing with shareholder disputes. We have six versions of this shareholders agreement with only small differences, making choice easy. All are designed for a private company in any business with any number of shareholders, some of whom will be directors. All assume that some shareholders will work in the company, but that is not essential. This one is for a new company with a major lender. Other versions are for existing companies and for companies where there has been no debt investment.